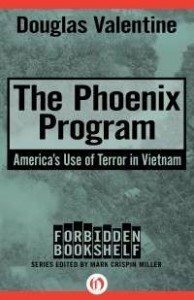 The Phoenix program was the culmination of a number of counterinsurgency plans undertaken by the Central Intelligence Agency, the military and a few other related agencies. All of these plans, like Phoenix itself, were designed to infiltrate and destroy the infrastructure of the communist-led Vietnamese insurgency—or as it was known by most US residents—the Viet Cong. Valentine describes in specific detail a bureaucratic machinery of torture and deceit: a single-minded operation designed to sow distrust, uncertainty and death. The first several chapters in the book describe and dissect the agencies, programs and individuals involved in the counterintelligence precursors to the Phoenix Program. It is a tale of inter-agency competition and occasional cooperation, clashing egos in Vietnam and DC and differences of opinion between Vietnamese and US police and government agencies. The latter is perhaps best exemplified by the different meanings attributed to the Phoenix bird symbol. The Vietnamese word for Phoenix is Phuang Hong, yet the graphic used by the Vietnamese represented hope, while the US symbol was a bird of prey holding missiles in its claws. Ron Jacobs is the author of The Way The Wind Blew: A History of the Weather Underground and Tripping Through the American Night, and the novels Short Order Frame Up and The Co-Conspirator’s Tale. His third novel All the Sinners, Saints is a companion to the previous two and was published early in 2013. Read other articles by Ron.